Providing a personalized learning path for every student means tracking more than just grades. You have to understand their individual needs, interests, and circumstances, which, as you know, is difficult when dealing with 20 plus students. You can record this information in a separate document or spreadsheet, but that can be cumbersome. Buzz can help. Where can I keep a running record of the information required to get students additional help or accelerated placement? Can I use Buzz to keep student-specific notes for use in parent-teacher conferences? What if I need to track special accommodations for a student? At the beginning of the course, create a Journal activity (How do I add activities with the Curriculum Map?). 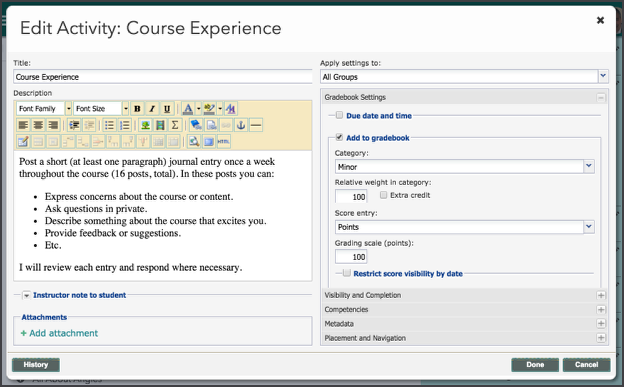 In the Journal Description, ask students to post entries about their experience with the course on a regular basis. Each time a student posts an entry, you are notified in your To-do List; you can open them from there or find them in your Gradebook. 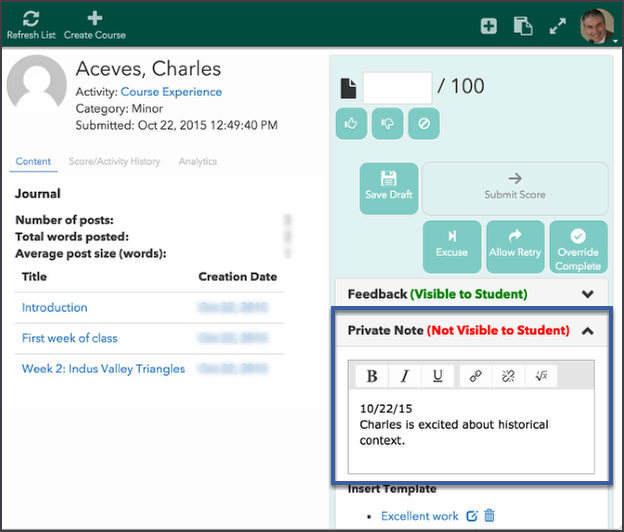 The entries open in the Grade Editor or Activity Grader; you can keep notes about each student in the Private Note field in the bottom right hand corner of those screens. Click Save Draft; you can return at any time to revise and add notes. By attaching your student notes to a course reflection journal, you can easily record your own answers or reactions to their needs. To ensure the privacy of the notes, collapse the Private Note field when opening the Journal activity in front of students.